Share how my book touched you! 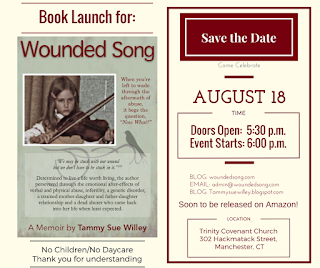 Gayle Powers Hill · August 18 at 10:01pm · Just got back from Tammy Sue Willey's book launch! What an incredibly touching, beautiful night! But from Tammy Sue and Curtis Willey it is no surprise it was incredible! Love the book! Hope millions of copies sell! Anyone could relate to the tenderness and honestly within. Nancy Boyden Pantaleo August 18 at 11:00pm You did it Tammy Sue Willey!! What a presentation and display!! Natalie Dark· August 19 at 7:58am · Had the wonderful privilege of attending a book launch for a very special lady. Tammy Sue Willey congratulations on an amazing accomplishment. If you want to read about live, forgiveness and redemption this is the book for you. Susan Wilbur Timreck August 19 at 9:24am It was nice to meet you, Natalie. Now I can put a face to all your postings!!!! Tammie Sue did an incredible job. Nancy Boyden Pantaleo August 19 at 12:05am Yes, thanks Gayle Powers Hill for taking pictures and showing people about Tammy SueWilley's book which for me after reading is a Wow!! Amazing!! Heartbreaking!! and made me feel almost every emotion throughout the book! Definitely a healing book and helps you towards the steps of forgiveness. Ruth Pouliot August 19 at 9:08am So well said Bob Millete and so well deserving Tammy Sue !! The message was her's and she owned it...The beauty of all the others who dared to speak and confess was a life changing experience for me...There was bravery and gallantry and so much love I thought my heart would burst....And after all that...there was homemade Cheesecake!! I'm a little more than halfway through your book. WOW. Very well written. Can't put it down. Shantel Hemby August 29, 2017 - Belinda Monforto shared a little of it with me as well sounds like you really put your whole heart into it aunty. But no shock there you have always been really good with everthing you do in my eyes. Kristen Gordon‎ to Tammy Sue Willey· August 24 at 3:23pm · Portland, ME · Happy Anniversary Tammy Sue Willey and Curtis Willey! Here's to many more! Tammy... I just ordered your book! Can't wait to read it! ‎Rita Guimond‎ to Tammy Sue Willey· August 21 at 12:56pm · Hi Tammy Sue: Congrats on your book ant the great event you had last Friday. I read all of the reviews and posts. I'm sorry I missed it. I am ordering a copy. Great accomplishment!!! Anna Johnson August 21 at 9:22pm Tammy Sue - CONGRATULATIONS on your book launch. Looks like it was amazing! I am so proud of you, I cannot wait to read it. I only wish that I could have been there. Love you! Carol Ann Hare August 20 at 11:54PM I ordered one for me and one for my friend's birthday on Tuesday. Again, congrats and I'm so proud of you for having the courage to write this book and share your journey. Excited to read it. Kathy Stark Futoma August 20 at 9:32pm So sorry was unable to make it to book signing which looked amazing in all the pictures! You look beautiful Tammy Sue and what a feat to write that book. I have 2 copies ordered as a friend also wants to read. I look forward to it arriving this week. Love you, bless you. Diane Notarnicola Gaffney August 7 at 7:08am It came while we were away for the weekend. Just started reading it last night. All I can say at this point is "Thank you for your being so open and allowing me to be privy to your story" I am also thankful for you and your friendship with our family. Love you much. Dawn Barrett· July 30 at 6:45am · So incredibly proud of my forever friend Tammy Sue Willey (Peterson) - she just published her first book. I had the privilege of reading a copy and would recommend it highly. It is a glimpse into her life as she recounts being a child growing up with an alcoholic, abusive parent. But there is no bitterness, just strength, perseverance, and ultimately forgiveness. Natalie Dark July 30 at 9:44am shared Change Your View and Change Your World's post. Hey All - - This is written by a woman I am proud to say is a friend of mine. I ordered my copy and can't wait for her launch! She is a truly amazing and beautiful woman.